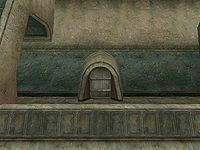 The St. Olms Waist North-One is the residence of Tralayn Vavas accessed from outside and located on the Waistworks level in the northern part of the St. Olms canton in Vivec. 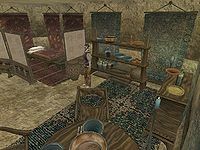 In the southwestern corner is a dresser filled with blueware, and a shelf with various sacks containing cheap food, along with a single gold coin in a bowl on it. There is a closet containing expensive clothing in the northeastern corner. In the southeastern corner is Tralayn's bed, next to which is a chest containing guaranteed 25 gold and up to 50 additional gold (60% chance each), as well as three baskets with a slight chance of containing special or marksman loot.